At high pressures deep beneath the earth’s surface, volcanic gases are dissolved in molten rock. But as magma rises toward the surface where the pressure is lower, gases held in the melt begin to form tiny bubbles. The increasing volume taken up by gas bubbles makes the magma less dense than the surrounding rock, which may allow the magma to continue its upward journey. 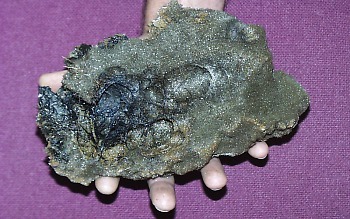 Closer to the surface, the bubbles increase in number and size so that the gas volume may exceed the melt volume in the magma, creating a magma foam. The rapidly expanding gas bubbles of the foam can lead to explosive eruptions in which the melt is fragmented into pieces of volcanic rock, known as tephra. If the molten rock is not fragmented by explosive activity, a lava flow will be generated. Together with the tephra and entrained air, volcanic gases can rise tens of kilometers into Earth’s atmosphere during large explosive eruptions. Once airborne, the prevailing winds may blow the eruption cloud hundreds to thousands of kilometers from a volcano. The gases spread from an erupting vent primarily as acid aerosols (tiny acid droplets), compounds attached to tephra particles, and microscopic salt particles. The volcanic gases that pose the greatest potential hazard to people, animals, agriculture, and property are sulfur dioxide, carbon dioxide, and hydrogen fluoride. Locally, sulfur dioxide gas can lead to acid rain and air pollution downwind from a volcano. Globally, large explosive eruptions that inject a tremendous volume of sulfur aerosols into the stratosphere can lead to lower surface temperatures and promote depletion of the Earth’s ozone layer. Because carbon dioxide gas is heavier than air, the gas may flow into in low-lying areas and collect in the soil. The concentration of carbon dioxide gas in these areas can be lethal to people, animals, and vegetation. A few historic eruptions have released sufficient fluorine-compounds to deform or kill animals that grazed on vegetation coated with volcanic ash; fluorine compounds tend to become concentrated on fine-grained ash particles, which can be ingested by animals. The effects of SO2 on people and the environment vary widely depending on (1) the amount of gas a volcano emits into the atmosphere; (2) whether the gas is injected into the troposphere or stratosphere; and (3) the regional or global wind and weather pattern that disperses the gas. Sulfur dioxide (SO2) is a colorless gas with a pungent odor that irritates skin and the tissues and mucous membranes of the eyes, nose, and throat. Sulfur dioxide chiefly affects upper respiratory tract and bronchi. The World Health Organization recommends a concentration of no greater than 0.5 ppm over 24 hours for maximum exposure. A concentration of 6-12 ppm can cause immediate irritation of the nose and throat; 20 ppm can cause eye irritation; 10,000 ppm will irritate moist skin within minutes. Emission rates of SO2 from an active volcano range from <20 tonnes/day to >10 million tonnes/day according to the style of volcanic activity and type and volume of magma involved. For example, the large explosive eruption of Mount Pinatubo on 15 June 1991 expelled 3-5 km3 of dacite magma and injected about 20 million metric tons of SO2 into the stratosphere. The sulfur aerosols resulted in a 0.5-0.6°C cooling of the Earth’s surface in the Northern Hemisphere. The sulfate aerosols also accelerated chemical reactions that, together with the increased stratospheric chlorine levels from human-made chlorofluorocarbon (CFC) pollution, destroyed ozone and led to some of the lowest ozone levels ever observed in the atmosphere. At Kilauea Volcano, the recent effusive eruption of about 0.0005 km3/day (500,000 m3) of basalt magma releases about 2,000 tonnes of SO2 into the lower troposphere. Downwind from the vent, acid rain and air pollution is a persistent health problem when the volcano is erupting. SO2 causes air pollution Volcanic smog. Eruptions of Kilauea Volcano release large quantities of sulfur dioxide gas into the atmosphere that can lead to volcanic air pollution on the Island of Hawai`i. Sulfur dioxide gas reacts chemically with sunlight, oxygen, dust particles, and water to form volcanic smog known as vog. SO2 effects Earth’s surface temperature Global cooling and ozone depletion. Measurements from recent eruptions such as Mount St. Helens, Washington (1980), El Chichon, Mexico (1982), and Mount Pinatubo, Philippines (1991), clearly show the importance of sulfur aerosols in modifying climate, warming the stratosphere, and cooling the troposphere. Research has also shown that the liquid drops of sulfuric acid promote the destruction of the Earth’s ozone layer. Hydrogen sulfide (H2S) is a colorless, flammable gas with a strong offensive odor. It is sometimes referred to as sewer gas. At low concentrations it can irritate the eyes and acts as a depressant; at high concentrations it can cause irritation of the upper respiratory tract and, during long exposure, pulmonary edema. A 30-minute exposure to 500 ppm results in headache, dizziness, excitement, staggering gait, and diarrhea, followed sometimes by bronchitis or bronchopneumonia. Volcanoes release more than 130 million tonnes of CO2 into the atmosphere every year. This colorless, odorless gas usually does not pose a direct hazard to life because it typically becomes diluted to low concentrations very quickly whether it is released continuously from the ground or during episodic eruptions. But in certain circumstances, CO2 may become concentrated at levels lethal to people and animals. Carbon dioxide gas is heavier than air and the gas can flow into in low-lying areas; breathing air with more than 30% CO2can quickly induce unconsciousness and cause death. In volcanic or other areas where CO2 emissions occur, it is important to avoid small depressions and low areas that might be CO2 traps. The boundary between air and lethal gas can be extremely sharp; even a single step upslope may be adequate to escape death. CO2 trapped in depressions can be lethal to people and animals. When a burning piece of cloth is lowered into a hole that has a high concentration of CO2, the fire goes out. Such a condition can be lethal to people and animals. Air with 5% CO2 causes perceptible increased respiration; 6-10% results in shortness of breath, headaches, dizziness, sweating, and general restlessness; 10-15% causes impaired coordination and abrupt muscle contractions; 20-30% causes loss of consciousness and convulsions; over 30% can cause death (Hathaway et. al., 1991). Please see the web article, “Volcanic Gases and Climate Change Overview” for more information on Volcanic versus anthropogenic CO2emissions. Chlorine gas is emitted from volcanoes in the form of hydrochloric acid (HCl). Exposure to the gas irritates mucous membranes of the eyes and respiratory tract. Concentrations over 35 ppm cause irritation of the throat after short exposure; >100 ppm results in pulmonary edema, and often laryngeal spasm. It also causes acid rain downwind from volcanoes because HCl is extremely soluble in condensing water droplets and it is a very “strong acid” (it dissociates extensively to give H+ ions in the droplets). Fluorine is a pale yellow gas that attaches to fine ash particles, coats grass, and pollutes streams and lakes. Exposure to this powerful caustic irritant can cause conjunctivitis, skin irritation, bone degeneration and mottling of teeth. 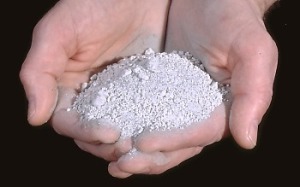 Excess fluorine results in a significant cause of death and injury in livestock during ash eruptions. Even in areas that receive just a millimeter of ash, poisoning can occur where the fluorine content of dried grass exceeds 250 ppm. Animals that eat grass coated with fluorine-tainted ash are poisoned. Small amounts of fluorine can be beneficial, but excess fluorine causes fluorosis, an affliction that eventually kills animals by destroying their bones. It also promotes acid rain effects downwind of volcanoes, like HCl. Another type of gas release occurs when lava flows reach the ocean. Extreme heat from molten lava boils and vaporizes seawater, leading to a series of chemical reactions. The boiling and reactions produce a large white plume, locally known as lava haze or laze, containing a mixture of hydrochloric acid and concentrated seawater. Laze plumes are very acidic. Extreme heat from lava entering the sea rapidly boils and vaporizes seawater, leading to a series of chemical reactions. The boiling and reactions produce a large white plume, locally known as lava haze or laze, which contains a mixture of hydrochloric acid (HCl) and concentrated seawater. This is a short-lived local phenomenon that only affects people or vegetation directly under the plume. The hydrochloric acid (HCl) comes from the breakdown of seawater-derived chlorides during sudden boiling. Because the lava is largely degassed by the time it reaches the sea, any HCL coming from it is insignificant by comparison. Analyzed samples of the plume show that is is a brine with a salinity of about 2.3 times that of seawater and a pH of 1.5-2.0. Avoid standing beneath a laze plume. 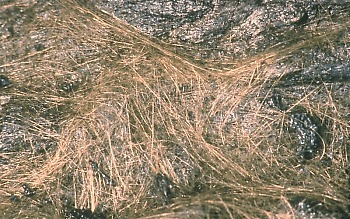 Dense laze plumes, such as that shown here (Photograph by C.C. Heliker, February 10, 1994) contain as much as 10-15 parts per million of hydrochloric acid. These values drop off sharply as the plume moves away from the lava entry areas. During along-shore or on-shore winds, this plume produces acid rain that may fall on people and land along the coast. This rain (pH 1.5 to 2), often more acidic that lime juice or stomach acid, is very corrosive to the skin and clothing. Visitors to the lava entry areas should avoid standing directly in, under, or downwind of the laze plume. Lahar is an Indonesian term that describes a hot or cold mixture of water and rock fragments flowing down the slopes of a volcano and (or) river valleys. When moving, a lahar looks like a mass of wet concrete that carries rock debris ranging in size from clay to boulders more than 10 m in diameter. Lahars vary in size and speed. Small lahars less than a few meters wide and several centimeters deep may flow a few meters per second. Large lahars hundreds of meters wide and tens of meters deep can flow several tens of meters per second–much too fast for people to outrun. Eruptions may trigger one or more lahars directly by quickly melting snow and ice on a volcano or ejecting water from a crater lake. More often, lahars are formed by intense rainfall during or after an eruption–rainwater can easily erode loose volcanic rock and soil on hillsides and in river valleys. Some of the largest lahars begin as landslides of saturated and hydrothermally altered rock on the flank of a volcano or adjacent hillslopes. Landslides are triggered by eruptions, earthquakes, precipitation, or the unceasing pull of gravity on the volcano. Lahars almost always occur on or near stratovolcanoes because these volcanoes tend to erupt explosively and their tall, steep cones are either snow covered, topped with a crater lake, constructed of weakly consolidated rock debris that is easily eroded, or internally weakened by hot hydrothermal fluids. Lahars are also common from the snow- and ice-covered shield volcanoes in Iceland where eruptions of fluid basalt lava frequently occur beneath huge glaciers. The scenarios listed below illustrate most of the mechanisms by which lahars are generated. For convenience, we’ve grouped the mechanisms according to whether a volcano is erupting, has erupted, or is quiet. Each mechanism is illustrated with one or more case studies. Landslides are common on volcanoes because their massive cones (1) typically rise hundreds to thousands of meters above the surrounding terrain; and (2) are often weakened by the very process that created them–the rise and eruption of molten rock. Each time magma moves toward the surface, overlying rocks are shouldered aside as the molten rock makes room for itself, often creating internal shear zones or oversteepening one or more sides of the cone. Magma that remains within the cone releases volcanic gases that partially dissolve in groundwater, resulting in a hot acidic hydrothermal system that weakens rock by altering rock minerals to clay. 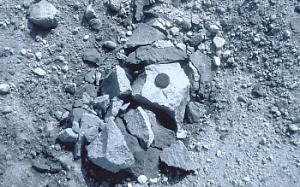 Furthermore, the tremendous mass of thousands of layers lava and loose fragmented rock debris can lead to internal faults and fault zones that move frequently as the cone “settles” under the downward pull of gravity. intense rainfall that saturates a volcano or adjacent tephra-covered hillslopes with water, especially before or during a large earthquake. By removing a large part of a volcano’s cone, a landslide may abruptly decrease pressure on the shallow magmatic and hydrothermal systems, which can generate explosions ranging from a small steam explosion to large steam- and magma-driven directed blasts. A large landslide often buries valleys with tens to hundreds of meters of rock debris, forming a chaotic landscape marked by dozens of small hills and closed depressions. If the deposit is thick enough, it may dam tributary streams to form lakes in the subsequent days to months; the lakes may eventually drain catastrophically and generate lahars and floods downstream. Figure 2. `A`a lava flow moves through an intersection in the Royal Garderns subdivision on the south flank of Kilauea Volcano, Hawai`i. Photograph by J.D. Griggs in 1984. Deaths caused directly by lava flows are uncommon because most move slowly enough that people can move out the way easily and flows usually don’t travel far from the vent. Death and injury can result when onlookers approach an advancing lava flow too closely or their retreat is cut off by other flows. Deaths attributed to lava flows are often due to related causes, such as explosions when lava interacts with water, the collapse of an active lava delta, asphyxiation due to accompanying toxic gases, pyroclastic flows from a collapsing dome, and lahars from meltwater. Lava erupted from Kilauea Volcano covers part of Highway 130 on the southeast coast of the Island of Hawai`i (see figure 3). By the end of 1998, lava from the Pu’u’ ‘O’o-Kupaianaha eruption covered about 13 km of the highway to depths as great as 25 m. Between 1983 and 1998, lava flows covered an area of 99.7 km2 (38.5 mi2). Figure 3. Lava buries or surrounds everything. One of the chief threats of lava flows to property owners is that the flows may burn buildings and homes even if the flow doesn’t reach the structure. This house caught fire from the intense heat of an advancing `a`a flow (note red glow of flow left of the house). Basalt has the highest temperature of any lava, typically between about 1170-1100°C (~2140-2000°F). The other lava types (andesite, dacite, and rhyolite) form cooler flows with temperatures between about 1000-800°C (~1800-1500°F); some flows can still move slowly at temperatures as low as about 600°C (~1100°F). Figure 4. View of eruption crater and ash-covered Vatnajökull glacier about 36 hours after the eruption had broken through the ice. Photograph courtesy of Magnús Tumi Guðmundsson. Science Institute, University of Iceland. October 1, 1996, 12:30 p.m.
On October 16, scientists stated that the meltwater, which had been accumulating under the ice shelf in the Grímsvötn caldera lake, could begin draining at any time to trigger a jökulhlaup (glacial outburst flood). On November 5 the expected jökulhlaup began. Collapsing lava flows trigger pyroclastic flows. The fast-moving pyroclastic flow was caused by the collapse of a thick lava flow that was extruding from the summit area and oozing down the volcano’s steep upper cone. When the lava flow collapsed, the hot lava broke apart into fragments ranging in size from boulders to tiny ash particles and swept down the volcano under the influence of gravity to form the pyroclastic flow; the flow reached a maximum distance of 4.5 km from the summit. Figure 5 shows a remnant of a building in Francisco Leon that was destroyed by pyroclastic flows and surges during the eruption of El Chichon volcano in southeastern Mexico between March 29 and April 4, 1982. Francisco Leon was located about 5 km SSE of the volcano. The reinforcement rods in the concrete wall are bent in the direction of flow (right to left). Several pyroclastic surges swept down all sides of the volcano, reaching as far as 2 to 8 km from the volcano; pyroclastic flows represent only about 30 percent of the total combined mass of surges and flows. In addition to Francisco Leon, eight other villages were destroyed, claiming the lives of up to 2,000 people. Pyroclastic flows erupted by Mount Pinatubo on June 15, 1991, buried the Marella River valley (SW of Pinatubo) with pumice, ash, and other volcanic rocks to depths of between 50 and 200 m (as shown in figure 6). This eruption was one of the largest in the 20th century, depositing about 5.5 km3 of rock debris over nearly 400 km2. The pyroclastic flows traveled as far as 12 to 16 km from the volcano in all directions. Unlike river valleys, the steep slopes around the volcano were veneered with very thin, discontinuous pyroclastic-flow deposits. Figure 7. Pyroclastic Flows melt snow and ice to form lahars. A series of pyroclastic flows from Redoubt Volcano in Alaska between December 1989 and April 1990 rapidly melted snow and ice that generated lahars in Drift River (valley in figure 7). The lahars swept 40 km to Cook Inlet. Most of the pyroclastic flows were caused by the repeated collapse of a lava dome growing high on the volcano’s north flank. This view across the upper Drift River valley is to the SW; the north flank is on the right side of the volcano, but the dome is not visible. As each pyroclastic flow swept down the volcano’s snow- and glacier-covered north flank, the hot lava-dome fragments eroded and mixed with the snow and ice to form a torrent of water that swept into Drift River. The sudden surges of water eroded loose sediment on the valley floor and transformed into lahars. In this part of the Drift River valley, many of the lahars covered the entire valley floor, but they were generally no more than a few meters thick. The lahars provided an excellent opportunity to test a new lahar detection system. Figure 8. Pyroclastic Flows burn forests, crops, and buildings. A small but highly fluidized pyroclastic flow traveled down the narrow Belham stream channel as far as 5 to 6 km from a lava dome growing at the summit of Soufriere Hills volcano in Montserrat (shown in figure 8). The basal part of the pyroclastic flow was confined to the channel bottom, but the overriding hot ash cloud burned and killed vegetation along the channel. The pyroclastic flow was triggered by a partial collapse of the dome. With initial temperatures higher than 900°C, the rock debris and gas carried by a pyroclastic flow or surge easily remain hot enough to burn or singe combustible material even when they travel more than 20 km from a vent. Increasing the rate of stream runoff and erosion during subsequent rainstorms. Hot pyroclastic flows and surges can also directly generate lahars by eroding and mixing with snow and ice on a volcano’s flanks, thereby sending a sudden torrent of water surging down adjacent valleys (see case study from Nevado del Ruiz volcano, Colombia). online report from Fire and Mud: eruptions and lahars of Mount Pinatubo, Philippines.